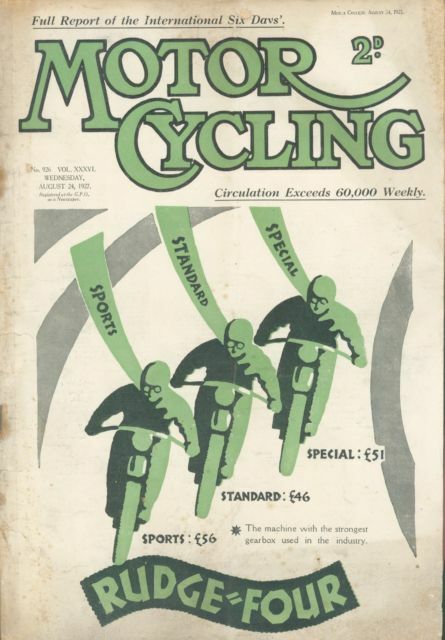 The ‘Motor Cycling‘ editorial is reproduced below, which whilst noting the success of the event, in particular the British Silver Vase ‘B’ Team who ended up winners and the first and only team of women to win the Vase pointed out some shortcomings in the organisation. THE International Six Day Trial, just concluded in Lakeland, has provided another victory for British machines. That was by no means unexpected, but, as a study of our report of the trial will show, it was thoroughly complete and convincing and by no means a mere “win on points.” It is further to be noted that the foreign team who were the runners-up for the International Vase – beating the English “A” team were mounted on British machines. Throughout the trial the riding of the Continental competitors earned high praise, and it may therefore be inferred that the British triumph is due to the excellence of the motorcycles produced by this country and not merely to the ability of our rider. We find, however, even greater cause for satisfaction in the achievement of the English ladies’ team in winning the International Vase That its members should have beaten their male opponents in a trial of this nature, over a course that was in portions, quite severe, speaks volumes for their skill and for the modern motorcycle, and the result of last week’s contest will, we believe, do much to further the popularity of motorcycling amongst women. To the visitors from abroad, and to the manufacturers of their machines, we can also offer our congratulations. They put up a spirited showing, and the Swedish team, in particular, was at one period distinctly menacing. We express the feelings of the whole of the British motorcycling world when we say that we look forward to seeIng an even stronger contingent from the Continent in next year’s International trial. In the past, after an important event organised by the Auto-Cycle Union, It has almost invariably been our happy duty to felicitate that body on its arrangements. Unfortunately, in the present instance , that impossible; on the contrary, we consider that the organization of the International Six Days’ was open to not a little criticism. It very largely failed both as regards planning and administration; the trial was not well conceived, nor was the conception carried out In a satisfactory manner. The selection of the routes can hardly be considered as fortunate ; the trial showed an extraordinary lack of balance , the serious work being almost entirely concentrated into Friday afternoon and Saturday morning. That was particularly unsatisfactory from the point of vIew of would-be spectators, and it may also be added that very little was done to acquaint the public of the fact that such an important and interesting event was being held. Great! Very good article. I love the individual apraisal of the riders.